The Australian Koala Silver Bullion Coin is produced by the Perth Mint of Australia and is one of the more popular bullion strikes in the world since first being offered in 2007. Not only do investors seek the 99.9% pure silver coins to add to their portfolios, but collectors also buy them owing in large part to their subject matter and the fact that the Perth changes the reverse designs annually. 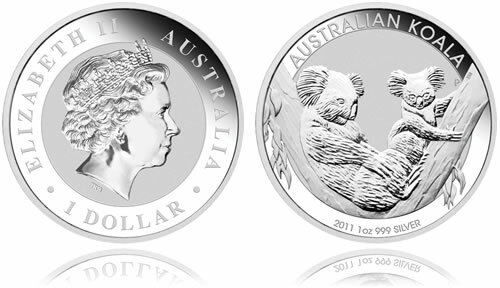 Traditionally, the Australian Koala Silver Coins have been available in four different sizes from the Perth Mint — 1 kilo, 10 ounce, 1 ounce and 1/2 ounce with face values of (AUS) $30, $10, $1 and $.50, respectively. However, beginning in 2011, the Perth also started offering a fifth option to the line-up, the 1/10 ounce ten cent strike. All coins are considered legal tender under the Australian Currency Act of 1965, but their true value lies either in the intrinsic melt value, or their numismatic value.